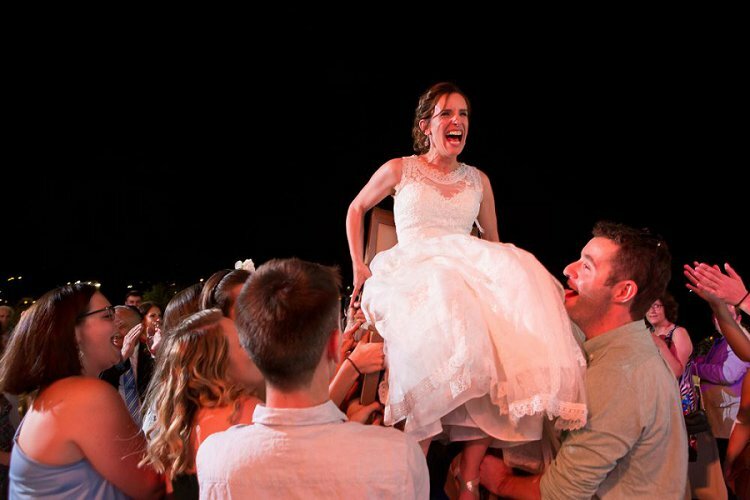 It’s no secret that we LOVE an Israeli wedding – but there’s something about a wedding in Jerusalem that is particularly spine tingling. 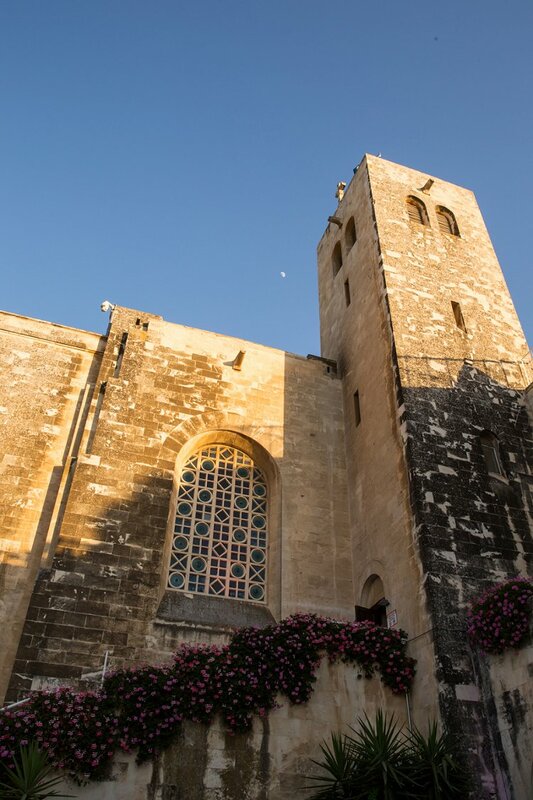 Jerusalem is the beating, living, bustling heart of the country, and means so much to so many religions and cultures. 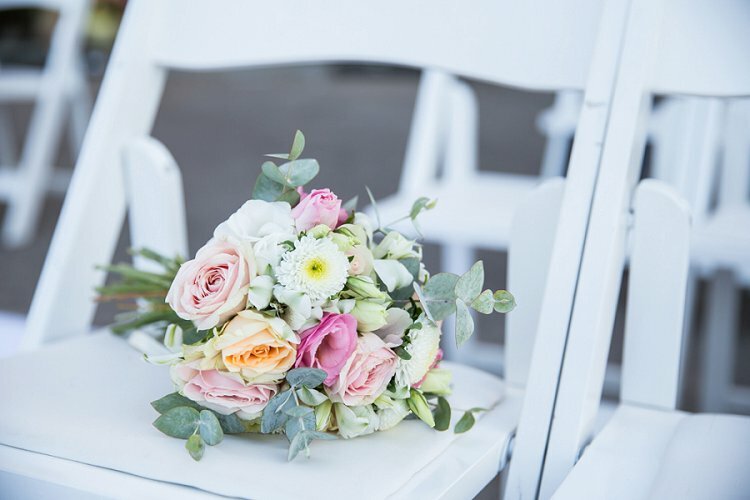 It’s also absolutely divine, with an energy like nowhere else, and a beauty that is really hard to describe in words – to get married there is something truly special. 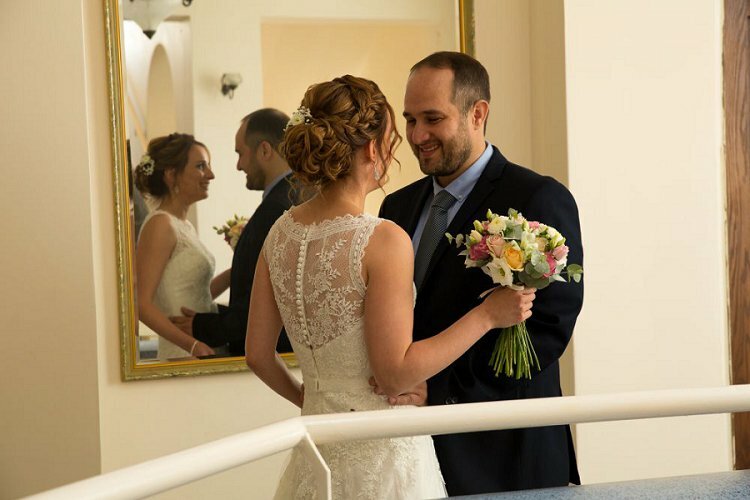 Ronee and Lior’s Jewish wedding took place at St Andrew’s Scottish Guesthouse. 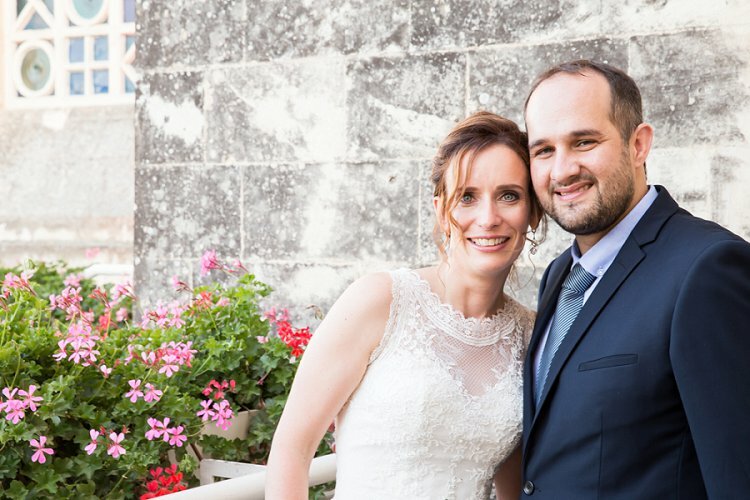 There’s something really brilliant about the idea of a little slice of Scotland in the Middle East, and for bride, Ronee, it was the perfect little nod to her British background. 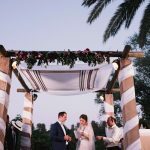 We were bowled over by the happy couple’s self-made chuppah. 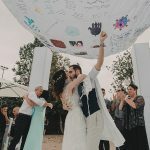 Every element of it had deep, personal meaning, including groom Lior’s family crest in the center, and friends and family were also involved in contributing squares with their own symbol for the bride and groom. This is such a gorgeous idea, and they pulled it off magnificently. 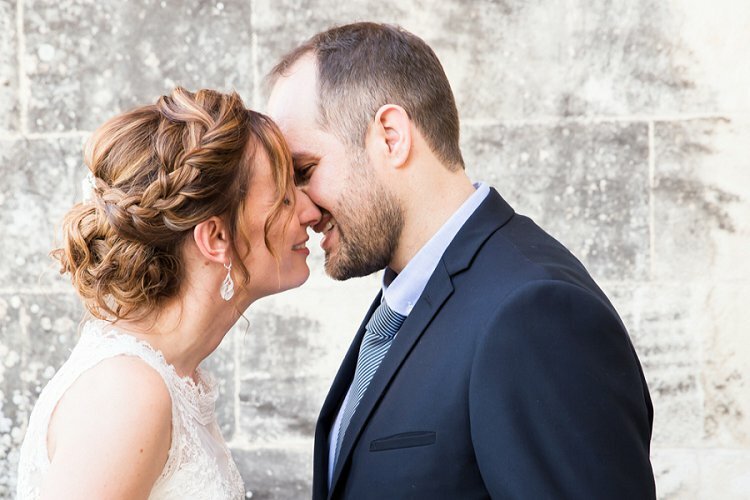 Bride Ronee looked absolutely beautiful in her two wedding dresses, and stunning braided up ‘do – simply breathtaking – we’re sure there will be a fair few brides Pinning her style! 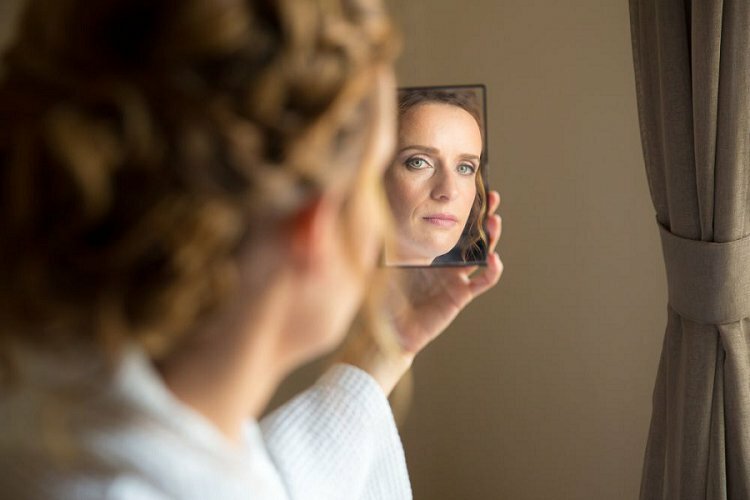 We’re also pretty sure you’re going to want to steal the couple’s unique mirror ‘reveal’, a great idea for personalizing for the traditional badeken, and the brainchild of fabulous photographer, Larry Brandt Photography who expertly captured the gorgeous big day. Hannah Larkin Photography was also on hand to capture some truly sensational images, and there were also SO many unique touches and flourishes – the very Israeli flower station trend juxtaposed with a fantastically fun, and very British, game of wedding bingo, that really made the night – oh and illuminated balloons on the dance floor! Fantastic! 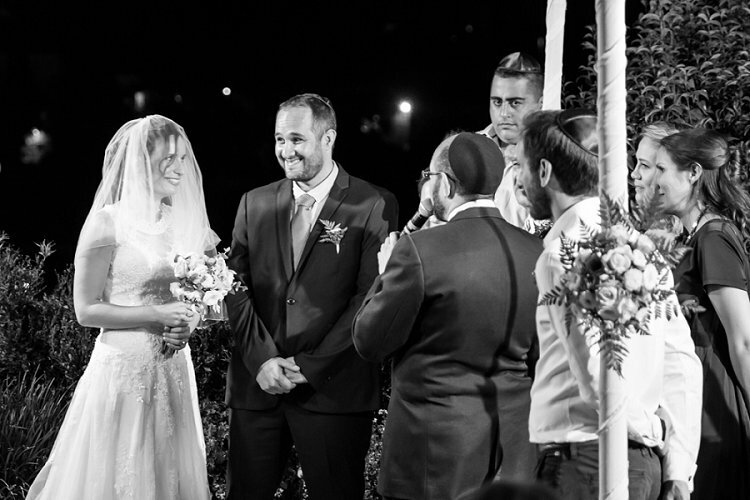 Groom Lior was so instrumental in the wedding planning that friends joked he should be on Don’t Tell the Bride, while bride Ronee made a speech. This gets ALL the thumbs up from us! 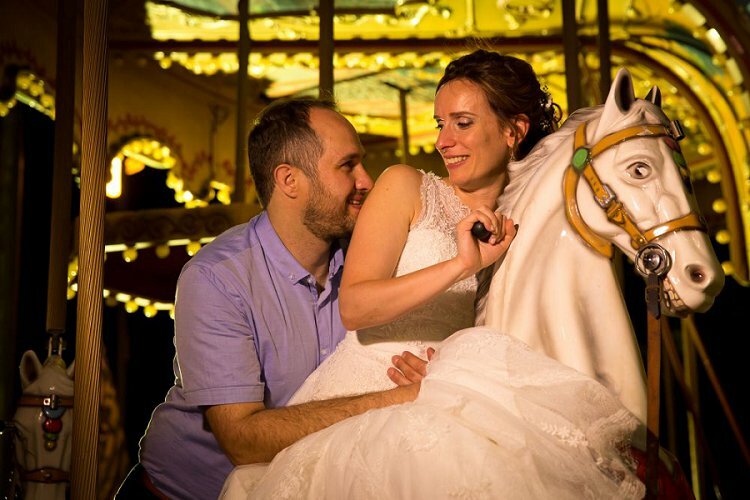 It’s Ronee’s turn as our latest STG bride to take over the blog for a post, so we’ll leave you in her capable hands. Take it away, Ronee! 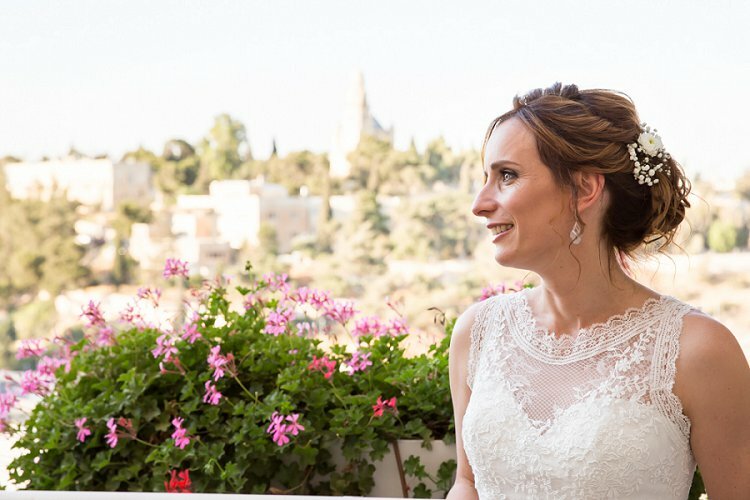 Ronee, the bride: We got married in the grounds of the St Andrew’s Scottish Guesthouse in Jerusalem, on the top of what is known as the ‘Bible Hill’. 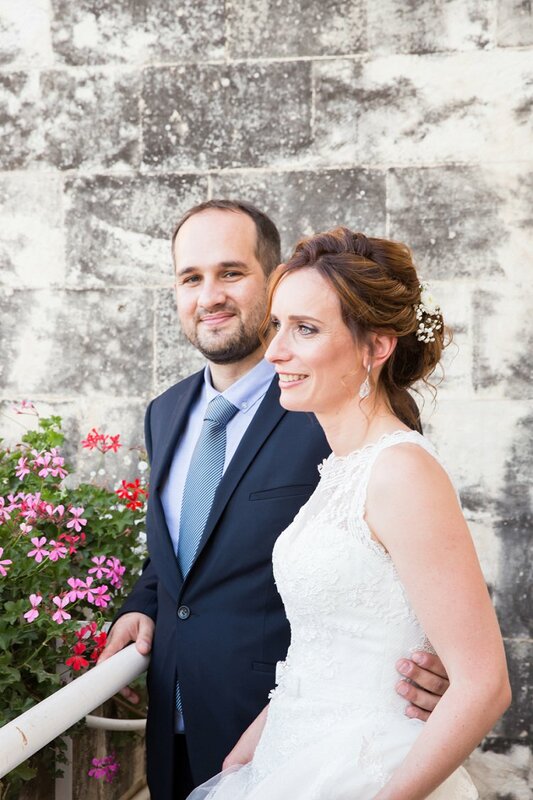 We wanted a wedding venue which reflected our geographical backgrounds (I’m from the UK; Lior is from Israel). My favorite place in the UK is the quiet, beautiful and historical land of Scotland. The Scottish Guesthouse therefore seemed a fitting place to get married! 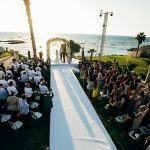 There were also some practical considerations – we got married in July and wanted the wedding outdoors and we didn’t want to risk the humidity and heat of Tel Aviv. 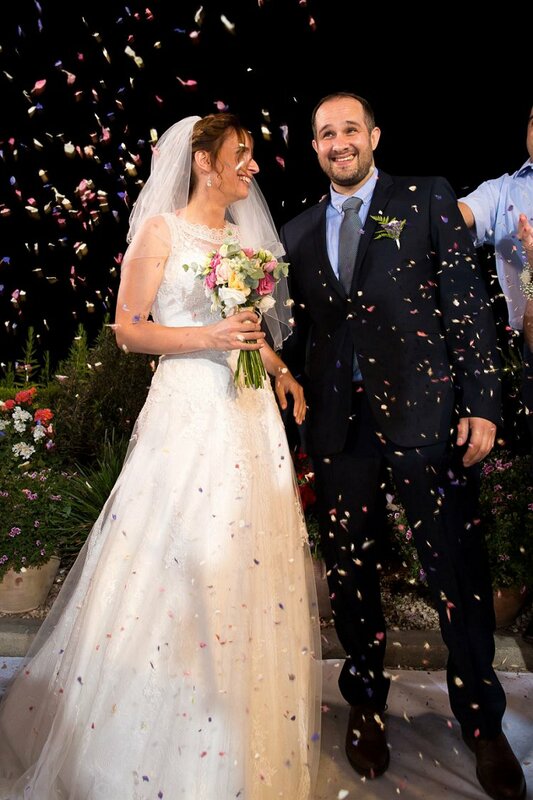 This decision was the right one, as there was a heatwave in early July, so we were very happy to be in Jerusalem! 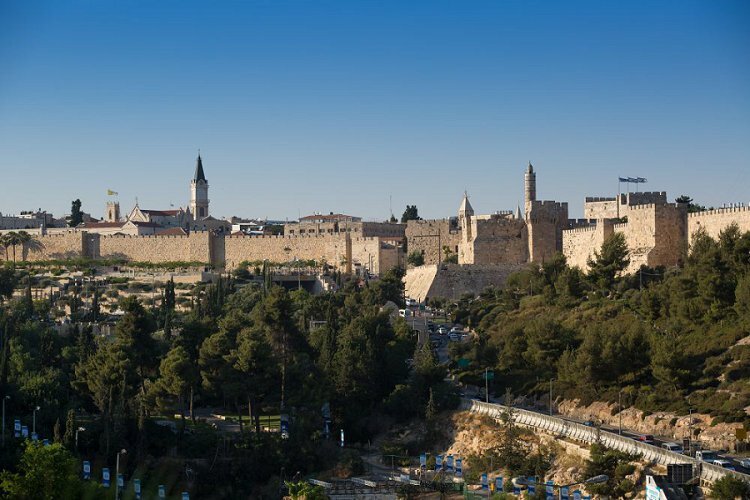 The Guesthouse is a mini castle in Jerusalem with a beautiful terrace with a stunning view over the old city. 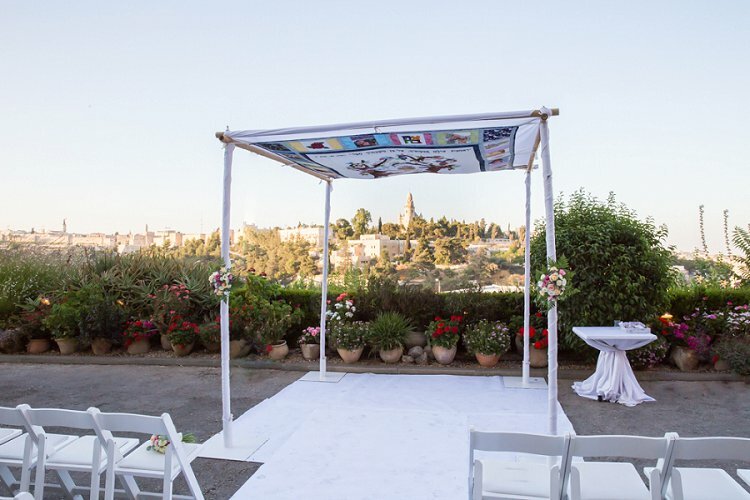 We had the chuppah on the terrace overlooking the walls of the old city. 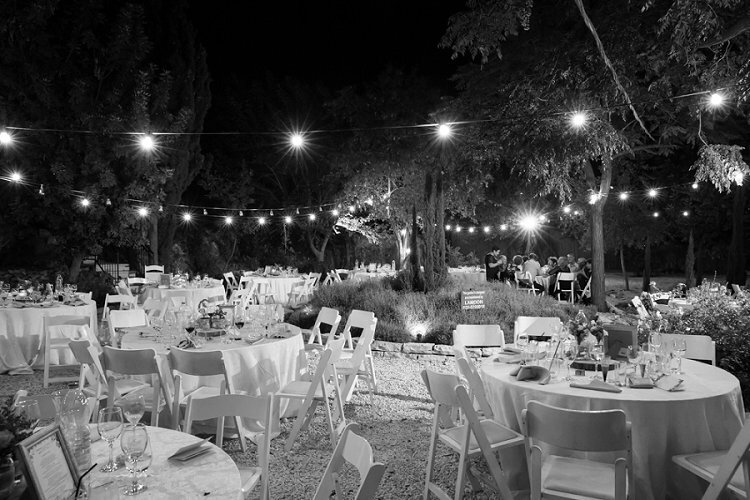 Our fantastic lighting supplier, Ofer, made the castle and garden look beautiful in the night with romantic and atmospheric lighting; each light was perfectly colored and positioned to create a unique atmosphere. This worked brilliantly! We were very lucky, as on the evening of our wedding there was a light show on the walls of the old city, which was part of the light festival of Jerusalem. We also managed to accommodate our 60 foreign guests at the Guesthouse, so they didn’t have to go far after the wedding! Everyone loved staying at the Guesthouse (including us!). It was immaculately clean and comfortable. The staff were all so friendly and accommodating and we look forward to returning next year for a holiday. 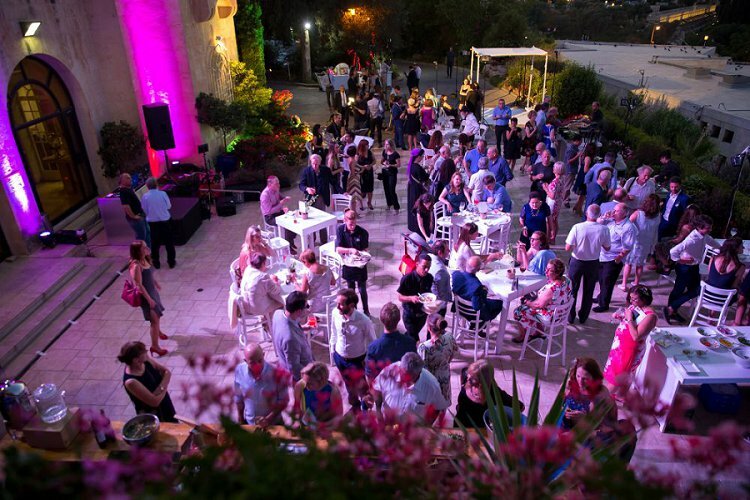 We incorporated some very Israeli elements (a drone videoing the event as part of the videography!) and some very English ones (my friend from university owns a high-end chocolate factory in the UK (Lessiters) and I schlepped over 200 heart milk chocolates in the baking heat as gifts for our guests and everyone loved it!). We put Dead Sea products in all the rooms before check-in as a small gift from us for our overseas guests. We also had magnets for all our guests to take home and everyone loved the idea. The quality of the print on the magnets was amazing, using the latest technology of thermal printing (as I said, Lior checked every detail for our wedding!). 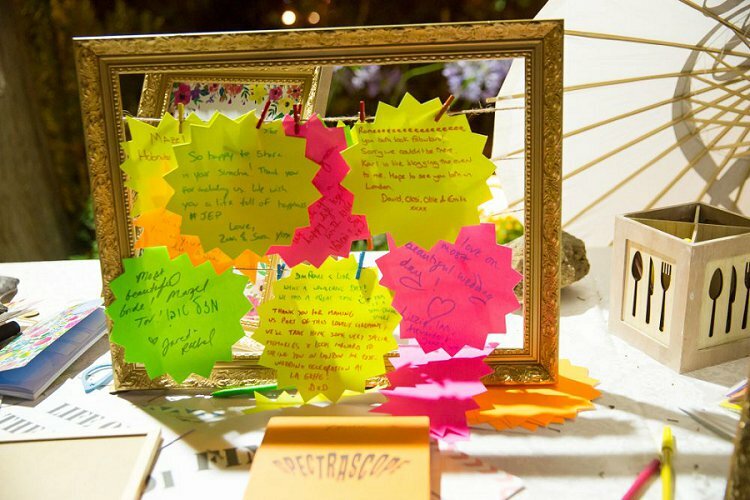 We didn’t use a wedding planner (although I can definitely see the value in one to reduce admin and stress!). 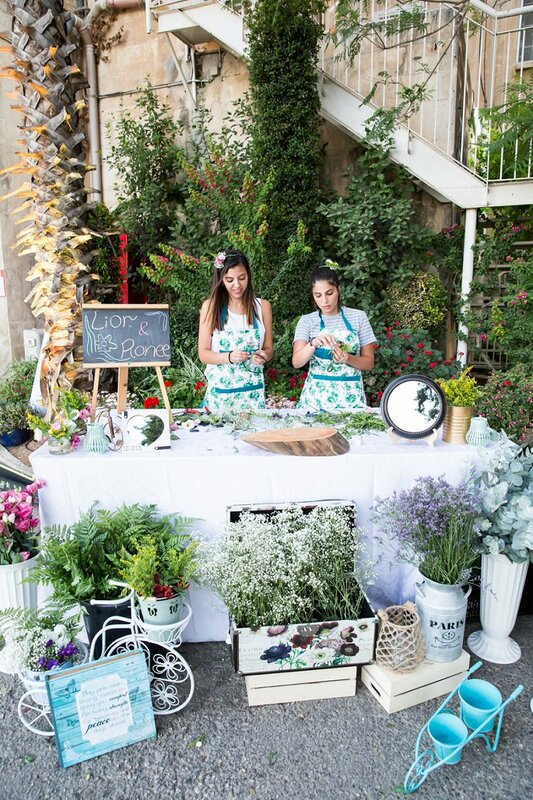 Lior did pretty much everything relating to our suppliers and the venue in Israel! All my friends joked that our wedding was going to feature on Don’t Tell The Bride! 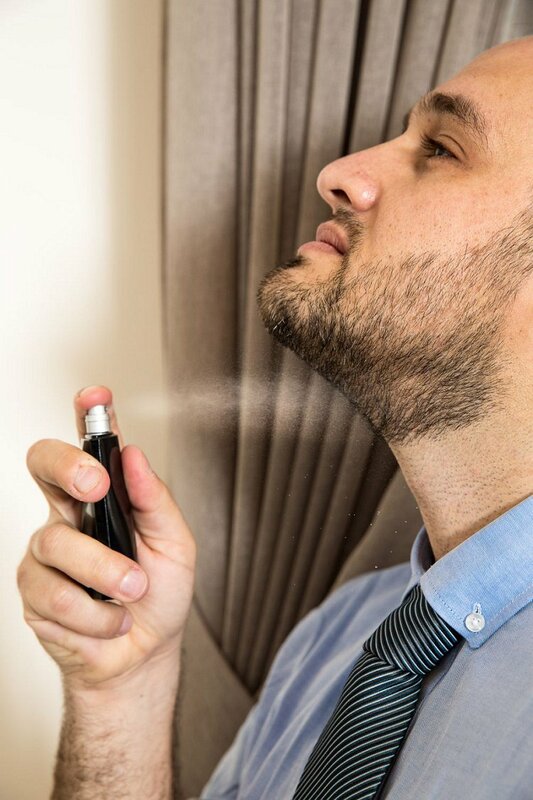 I wasn’t worried – I knew he would do a fantastic job as he is as meticulous as I am! I helped by schlepping over everything from London relating to the table design – wood blocks (yes 15 of them! 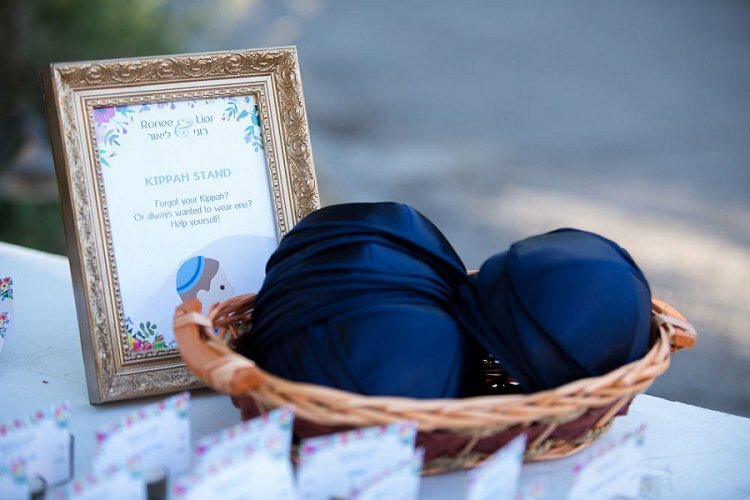 ); 60 jam jars (yes, I know there are jam jars in Israel) and about 15 picture frames for all the reception menus, dinner menus, kippah stand etc. Everyone thought I was crazy, but I wanted to take the stress off Lior and these things were so much easier to organise in London (and cheaper!) than in Israel. Illanit Cohen of Ilanit Design is a fantastic graphic designer and she helped us design a bespoke graphic and print for all of the menus, signs (kippah stand, Cocktail list), order of service, benchers, ‘thank you’ notes and ‘welcome to our wedding’ sign in Hebrew and English. Everyone commented on how professionally branded our wedding was! For many of my friends and family as it was their first time in Israel, so we put together a long weekend of activities: cocktails on the beach in Tel Aviv; a trip to the Dead Sea and a tour of Jerusalem. 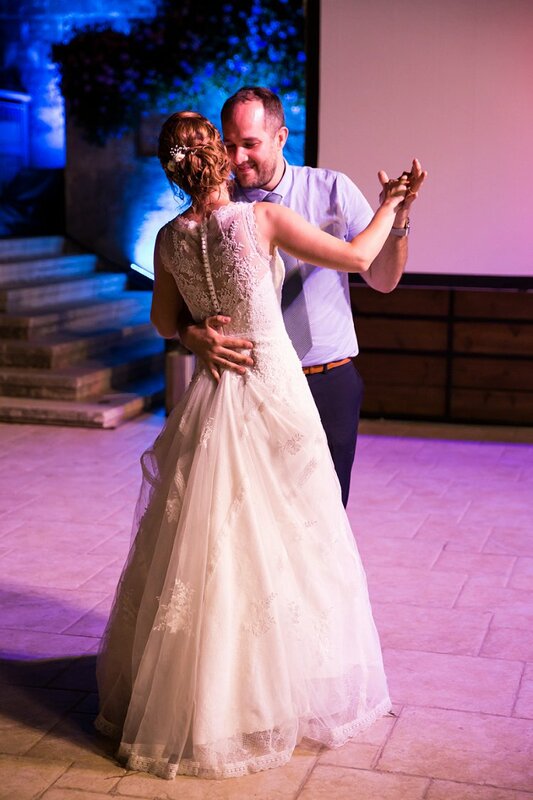 We didn’t send paper invites but rather used the free website The Knot so we could have lots of details about the trips, the wedding, getting around Israel, hummus recommendations etc. It was the easiest way to update everyone about what was going on. 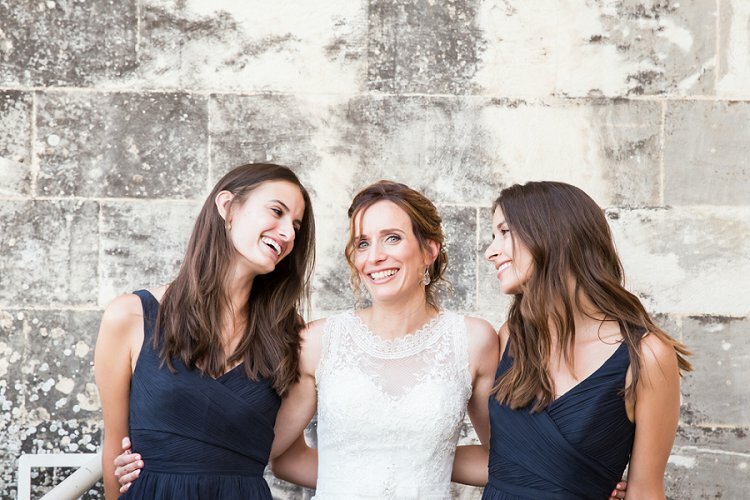 Luckily for me, Lior’s sister got married a year before, so I knew exactly who to use for my hair and makeup! 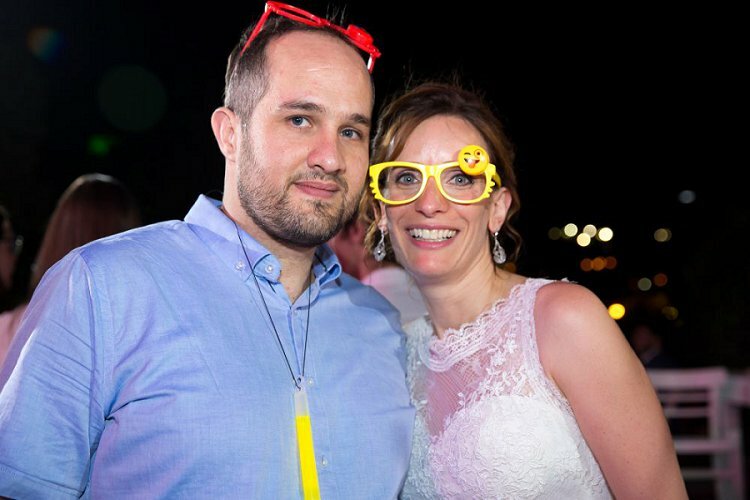 Both Raz and Devorah were amazing to work with and phenomenally talented and both native English speakers, so the communication was perfect. For me this was really important and made getting my hair and makeup done fun, pleasurable and without stress. Raz is fantastic, as she blends her passion for hair with unbelievable skill and precision and is just a lovely and calm person to work with. She couldn’t have done her job more diligently. I don’t usually wear makeup, so I was very worried that I wouldn’t feel like ‘me’. Devorah was amazing and so patient and we discussed at length every aspect of my face beforehand. 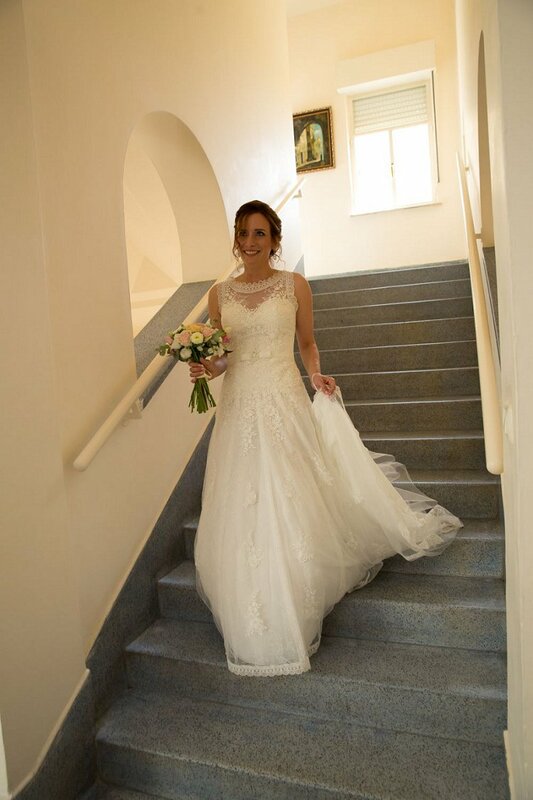 I was so pleased with the end result and really felt so special and bridal on the day. 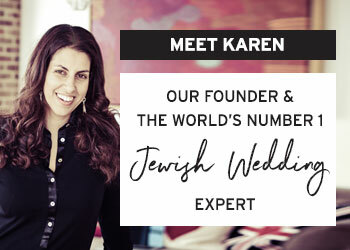 Devorah has her own brand of makeup which is excellent and fits to the Israeli climate! Also, Devorah gave me a concealer, powder and lipstick for the wedding evening event so I could top up if I needed. It was very helpful and she clearly had thought of everything! 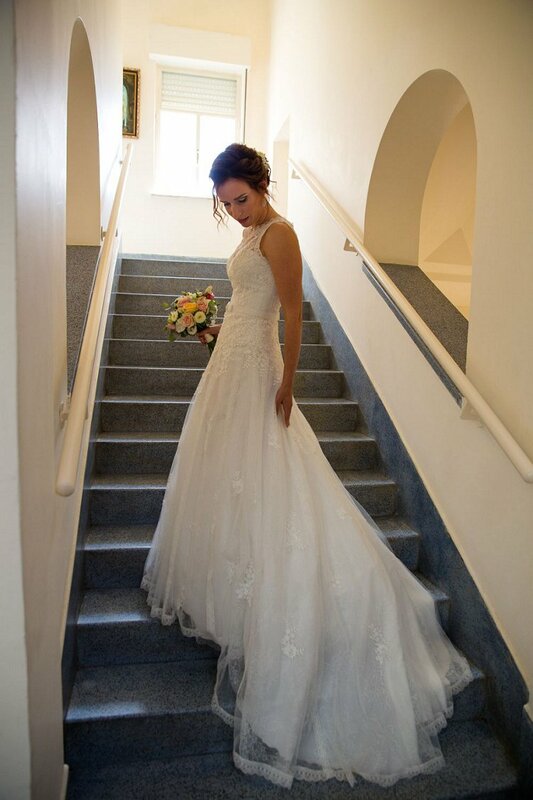 I had two dresses – for very practical reasons. 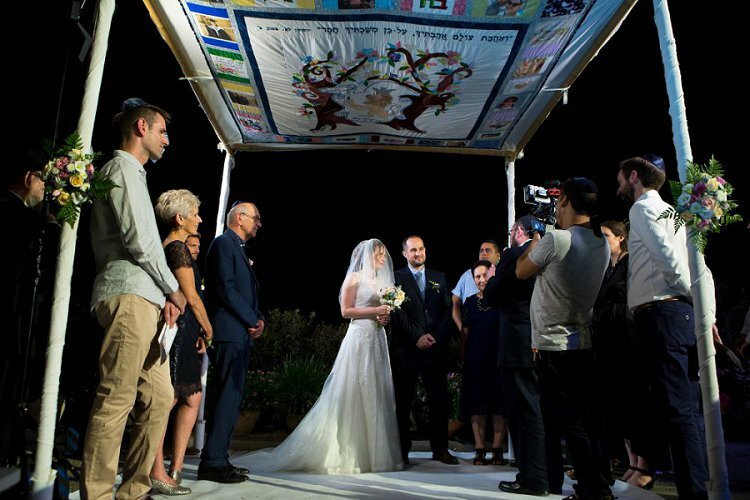 As most of our guests were Israeli, we could only start the chuppah after their work finished. This meant our canapà© reception was before the chuppah. 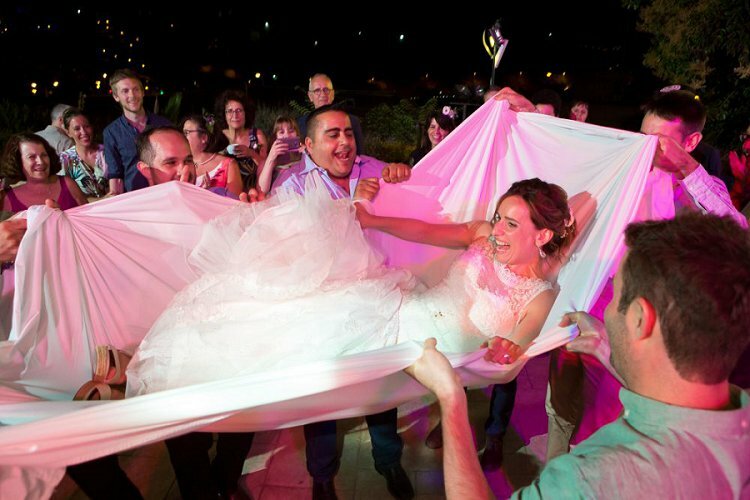 I was convinced that I (or a guest) was going to spill red wine on my dress at the reception before the chuppah and then I would have to walk up the aisle with an embarassing spot! Anyway, I avoided the problem by buying an off-the-shelf dress for the reception and then changed into the bridal dress. 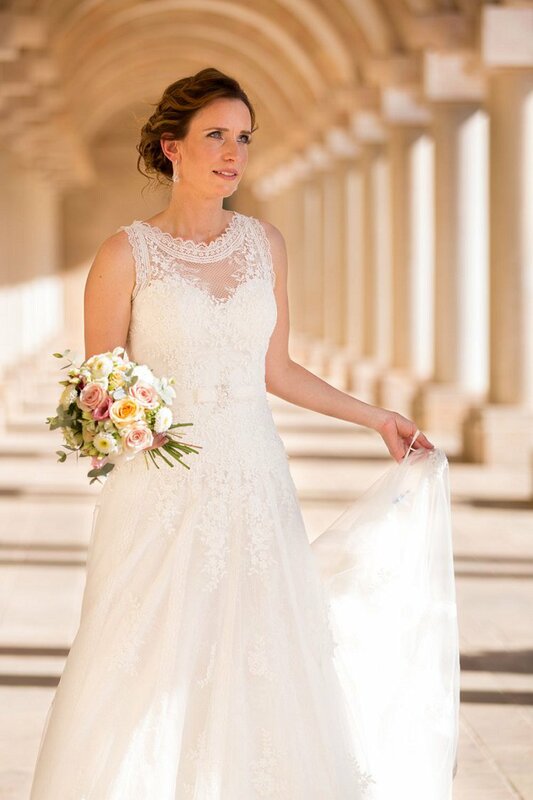 I bought my dress from Morgan Davies in the UK (Hitchin branch) from a Spanish designer. My friend Mishie Rosswick (another STG bride) recommended the shop to me. They were so lovely and allowed me to take a few pictures of me in the dress (which is surprisingly rare!). 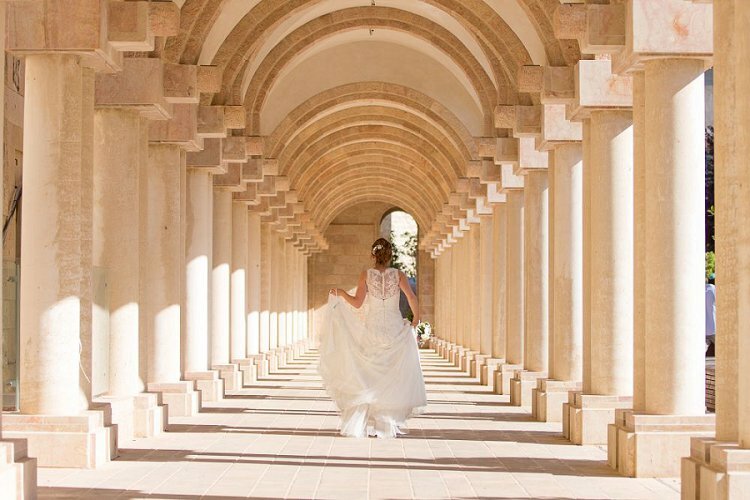 I wanted a classic, romantic but unfussy dress as we got married in a (mini) castle in Jerusalem! 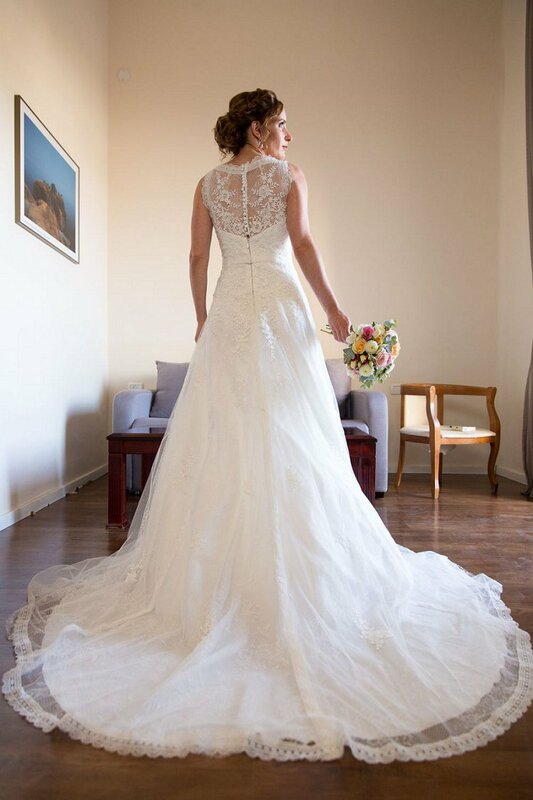 I also cannot recommend enough my seamstress, Deborah, who was recommended by Morgan Davies who tailored the dress perfectly to fit me. 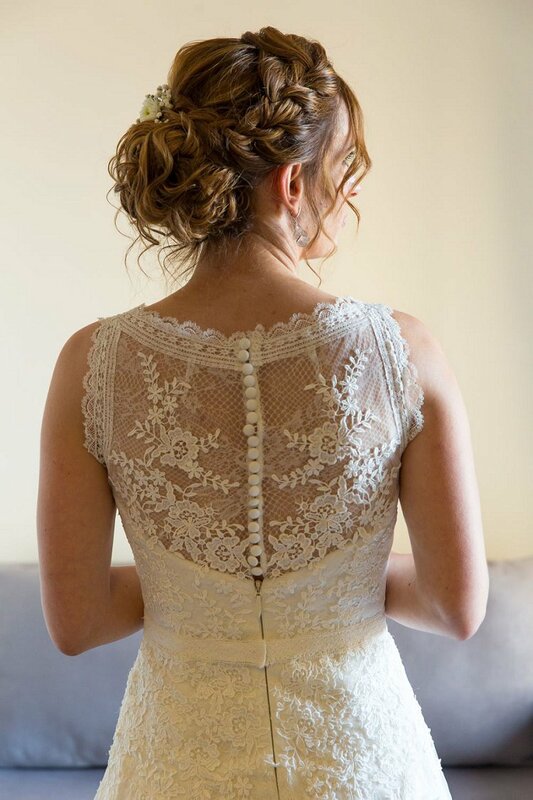 My advice to brides is that the seamstress is as important as the dress to get right! My best friend lent me her veil so that was simple. I had real mini white flowers in my hair designed by Tovit, our flower designer, and placed in my hair by my hairdresser Raz. Despite the heat, the flowers survived very well into the night and looked beautiful! Lior bought me for my birthday a month before the wedding a lovely pair of white gold earrings (we bought them in the Diamond area of Ramat Gan) so I wore those too. Shoes was the easiest decision! My sister-in-law bought her wedding shoes from Rachel Simpson a few years ago and I loved her shoes so I bought a similar pair! 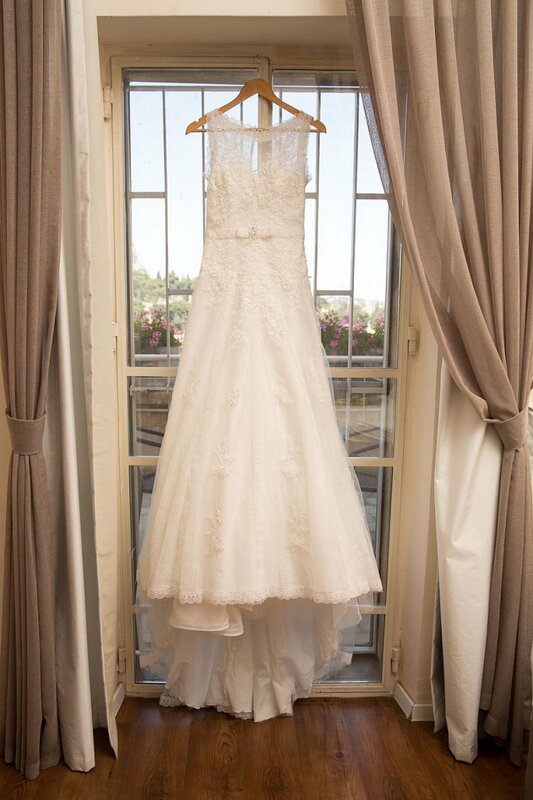 I had no style preference, I just wanted something comfortable and elegant to go with my dress. They were lace and ivory with a small kitten heel. 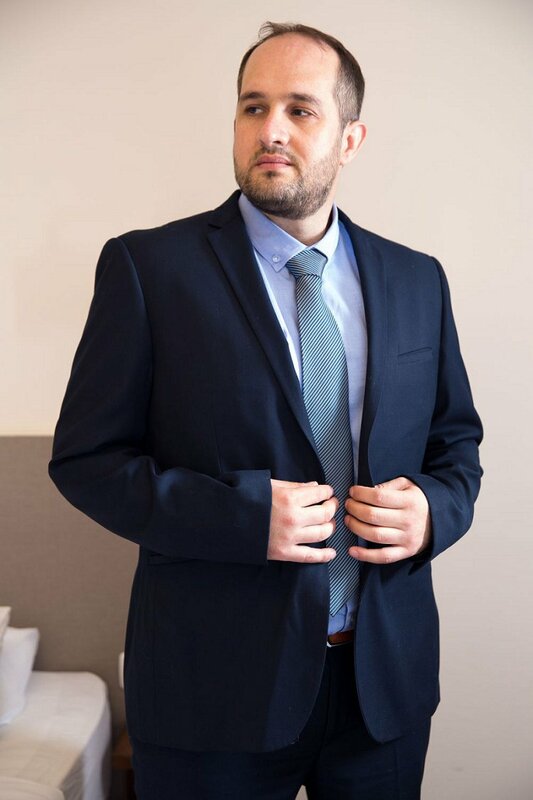 Lior wore a navy suit and pale blue shirt. He looked really dapper! Blue is his colour – he has blue eyes (it’s as simple as that!). We had our professional couple photos in the afternoon before the wedding, so we needed a ‘reveal’ to see each other for the first time on the wedding day. Our photographer Larry Brandt came up with a really cool and innovative idea for Lior first to see me through a mirror as I came down the stairs at the Scottish guesthouse! He really created and directed the moment and it was a perfect surprise and his photos reflect this first intimate romantic reveal. I think we were both astonished and impressed from each other’s appearance! I had my cousins and baby niece as my bridesmaids. I bought my niece a cute dress from Monsoon and she looked just adorable. 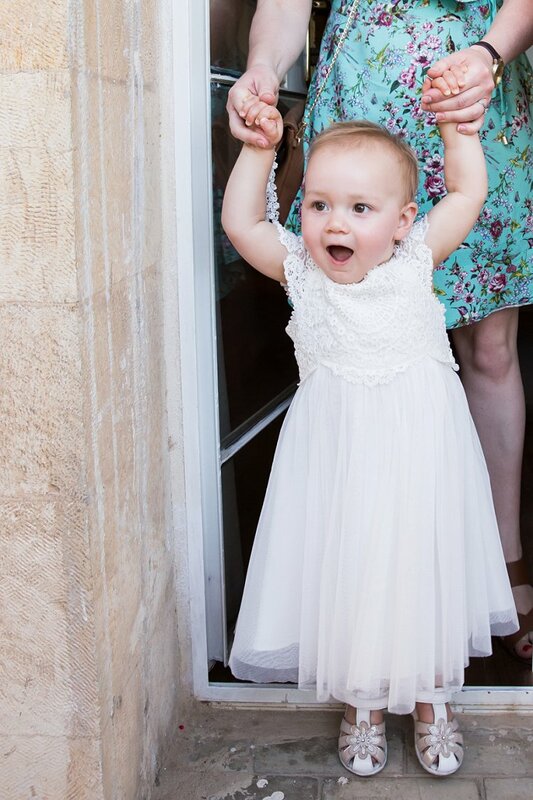 There is a really lovely picture when she sees me in my dress for the first time and her little face is just shocked! I didn’t see at all my cousins’ dresses until they were in them just before the family pictures at the wedding as they live in the USA. I left the dresses totally up to them. I was not worried at all as they were always going to look fabulous… and they did! One of my friends actually asked whether I had hired some supermodels for the day! 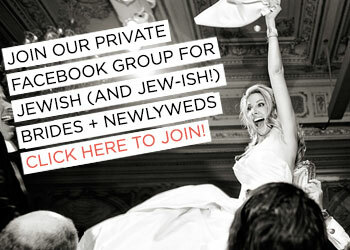 One of the best things we decided on was to create and design our own chuppah cover. 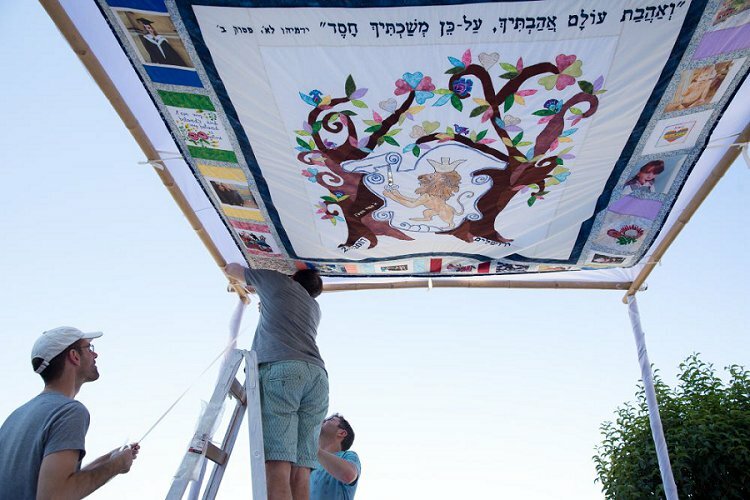 Lior’s family friend is a professional quilter and she created our chuppah with us. We had a lion at the center, as this is Lior’s family’s coat of arms, surrounded by a tree of life. We had lots of pictures of us and our family in the squares on the outside, as well as embroidered flowers/fruits which represent our different family backgrounds – English, Israeli, Dutch and South African. My friends also designed a few beautiful squares with a love heart in cross stitch and painted square with the famous saying ‘I am my beloved and my beloved is mine’. Lior’s sisters designed a square with a colourful ‘Ahava’ (love) sign reminiscent of the statue in the garden of the Israel Museum in Jerusalem. 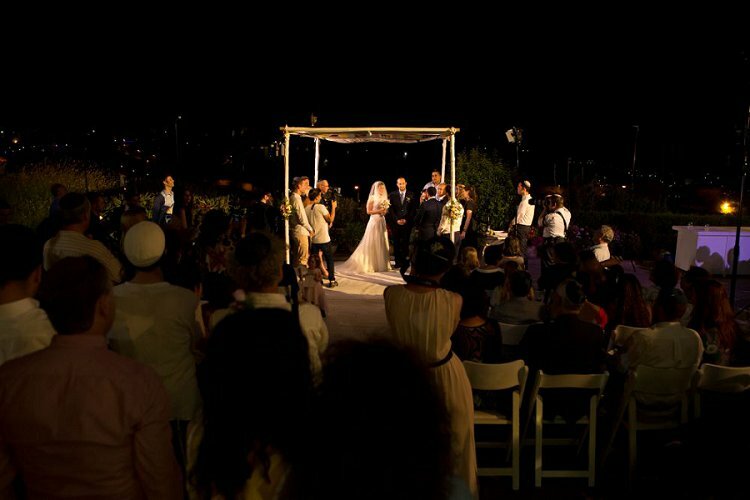 It was so moving to stand under the chuppah which we had designed. 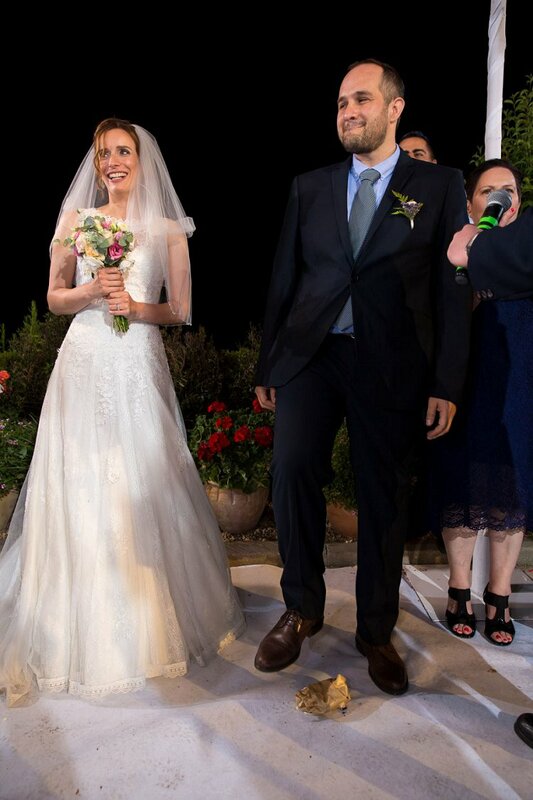 We got married through the Tzohar organisation (who work with the Rabbinate). They were brilliant to deal with – efficient; friendly and very non-judgmental. 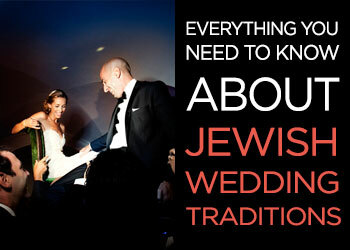 We would recommend any Jewish couples who want a Jewish wedding in Israel with a friendly approach to go through Tzohar. 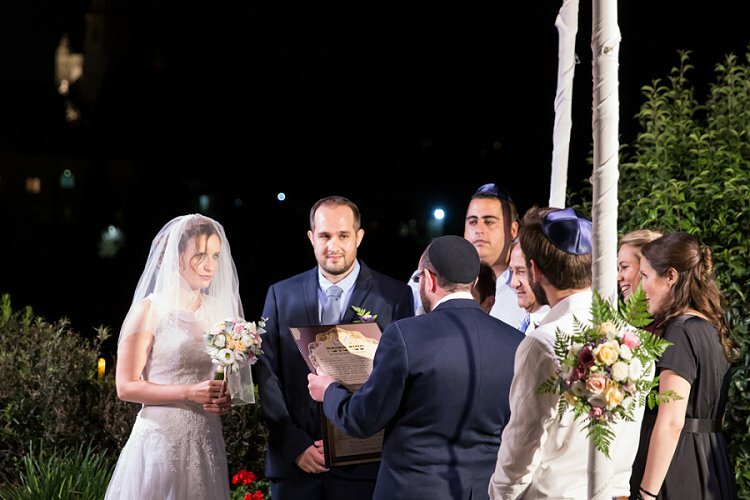 Tzohar provided our Rabbi (Rabbi Yehoshua Grunstein who is a native English speaker living in Israel), the ketubah based on whether you want Ashkenazi or Sephardi and options for marriage lessons. 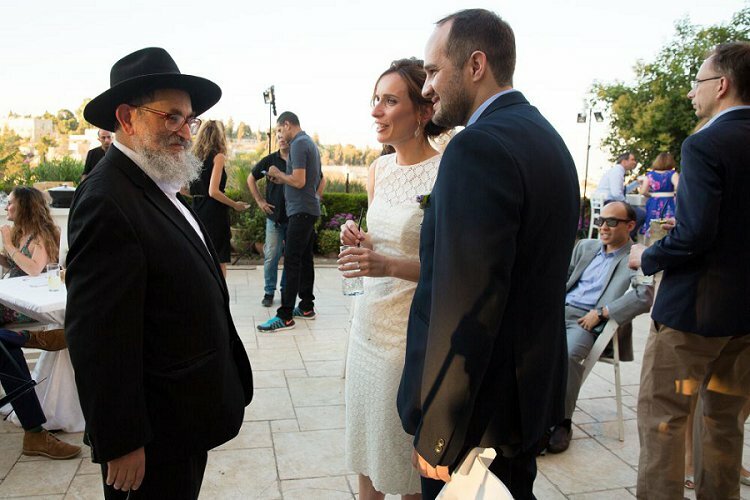 We were so fortunate to have the Rabbi who introduced Lior and I (on a holiday in Valencia) leading the Sheva Brachot under the chuppah (Rabbi Zevi Ives). 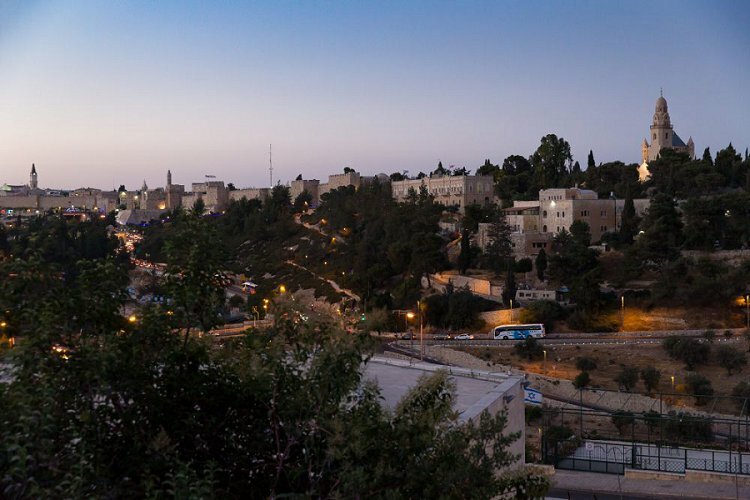 Zevi has a phenomenal voice and everyone remembers him singing the Sheva Brachot so beautifully with the sounds echoing over the walls of Jerusalem. We also chose a professional musician brass band who composed and worked with our DJ (Tal) to create some specific songs for us entering the ceremony, the blessings and smashing the glass! The songs are now on YouTube and we just can’t stop listening to them. The brass band put so much effort into our wedding to make it unique. We thought that a brass band playing classic and modern music fitted to the location and atmosphere. People really noticed and commented on how great the music was throughout the event. Lior chose Stevie Wonder, Signed, Sealed, Delivered (well he had just signed the ketubah!) and I chose Boi Kallah to walk down the aisle. 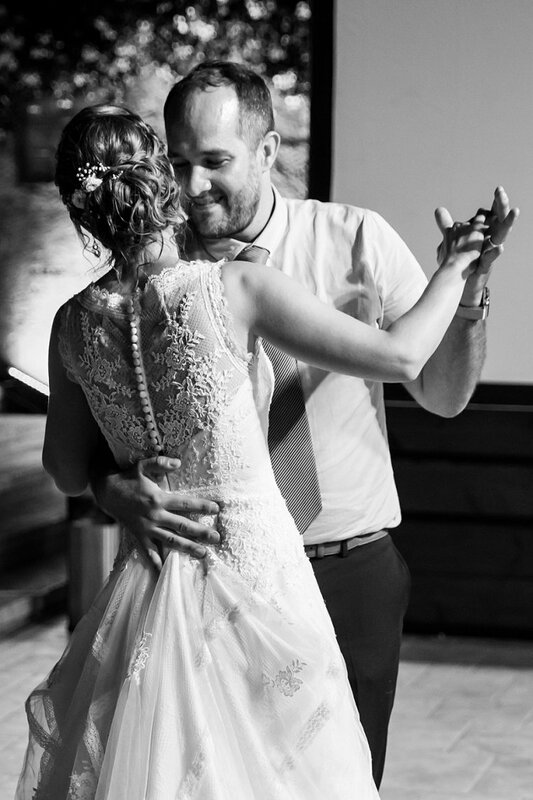 We were very nervous about our first dance to I Need You (Rod Stewart) but I think we managed to pull it off and even had a few lifts (not Dirty Dancing style) but enough to create a bit of excitement! 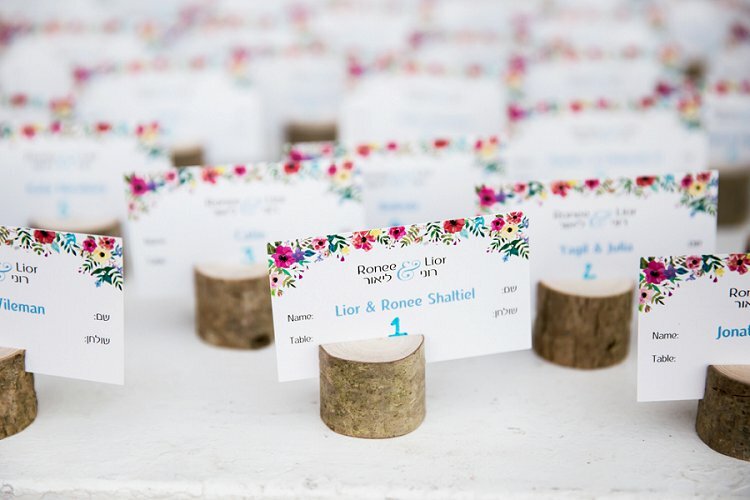 One of the best decisions we made was to have a flower stand where guests could choose a design and get made on the spot a bracelet, lapel or hair piece. 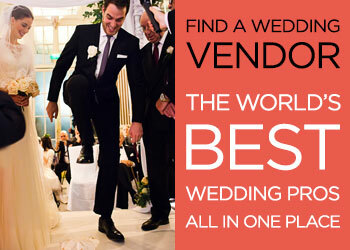 We chose to work with Tovit of Toosha Flowers & Event Design for our wedding design. She is phenomenal and beautifully designed the flower stand, my bouquet, the flowers for the table etc. 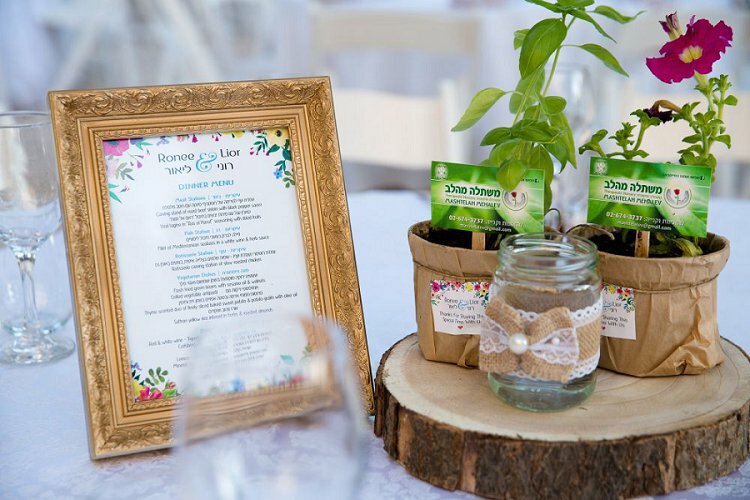 Tovit also helped organise some little colorful pot plants to decorate the tables which were made by a local charity for vulnerable adults, so we felt we were also contributing something on our wedding day. 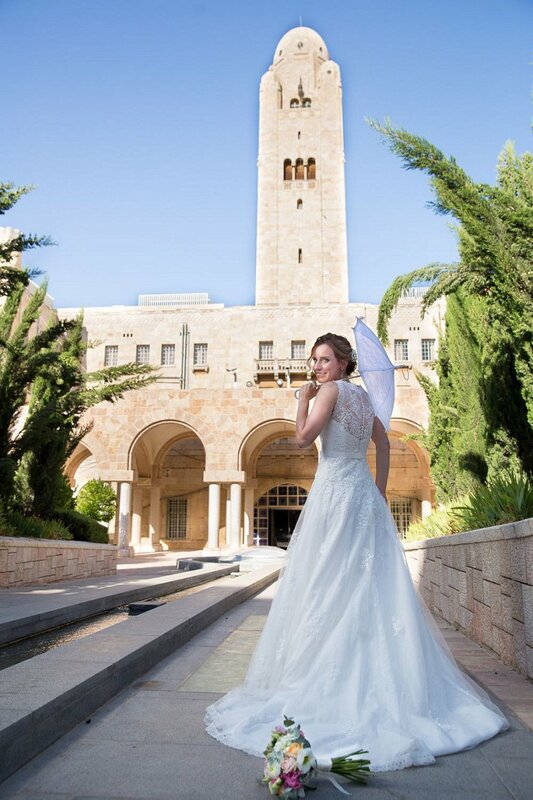 One of our best decisions was to choose to work with our Israeli photographer Larry. He was so professional, talented and artistic to come up with some amazing ideas for a location shoot and interesting photo scenes such as: using the mirror to create a reflection when Lior saw me for the first time, using the shadows of the Roman arches in Jerusalem to highlight my dress and we even had a wedding shoot at night after the wedding at 2am with different colour light filters (see the one of us on the carousel and overlooking the old city!). 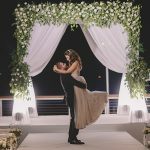 Photographing a wedding outside at night requires specialist lighting and Larry provided the lighting which we needed and worked together with his assistant photographer to create exactly the correct composition of the photos. 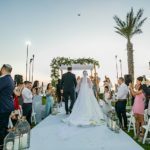 He was born in South Africa and moved to Israel, so he is bilingual and understands the different cultures and how to manage the photography of the whole event. He made us feel so relaxed and to be ourselves before, during and after the wedding. He captured some unique moments. Larry also coordinated our videographer to ensure we had exactly the video we wanted. We were also very fortunate to have Hannah Larkin as our guest at the wedding. She is my friend from the UK and also an amazing professional photographer. 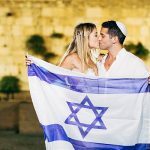 Even though we got married in Israel, I really wanted her to take photos of us at the wedding as I love her romantic style of photography and appreciate her talent. Hannah took the couple photos of us on the balcony overlooking Jerusalem and the wedding event from another angle and perspective. 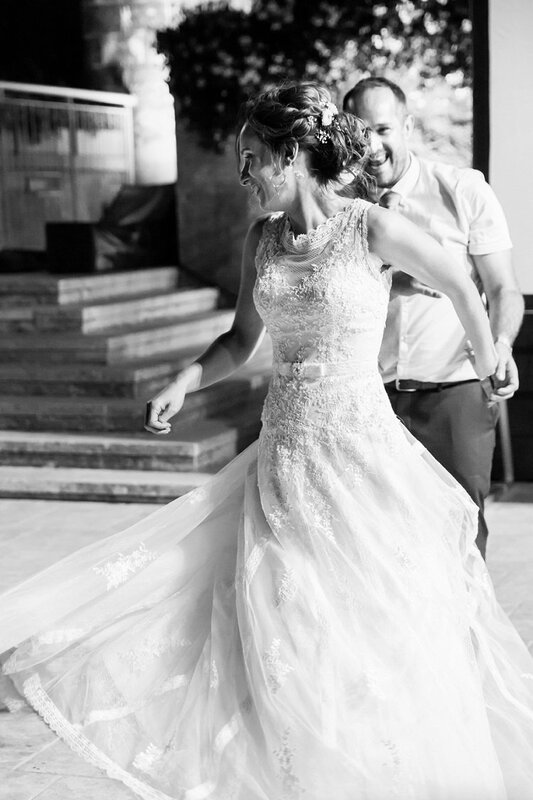 We loved all her photos but in particular the black and white ones of the dancing which make the photos of the wedding seem timeless and romantic set against the background of Jerusalem and the castle. Hannah also helped us choose Larry as we both loved his style of photography and his pictures are just so crisp and clear. 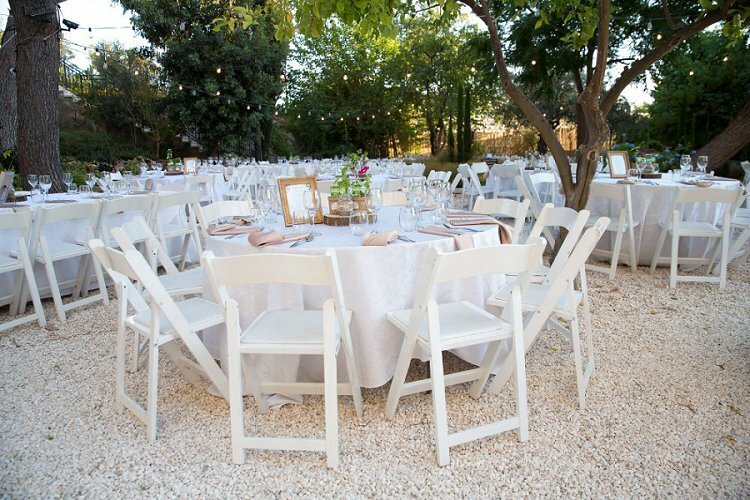 We chose one of the main professional caterers in Jerusalem (Cezanne) who works with the Scottish Guesthouse. 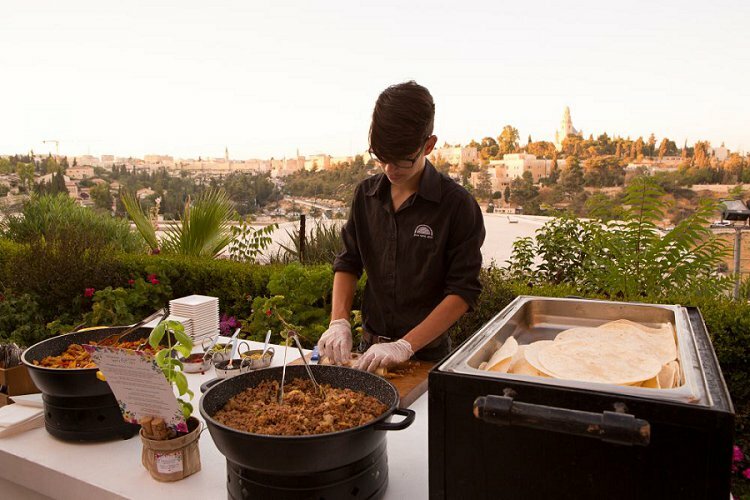 In true Israeli style we had a buffet for dinner (in the garden at the back) and food stations at the reception to ensure our guests enjoyed their food during the sunset overlooking the colourful Jerusalem old city walls. 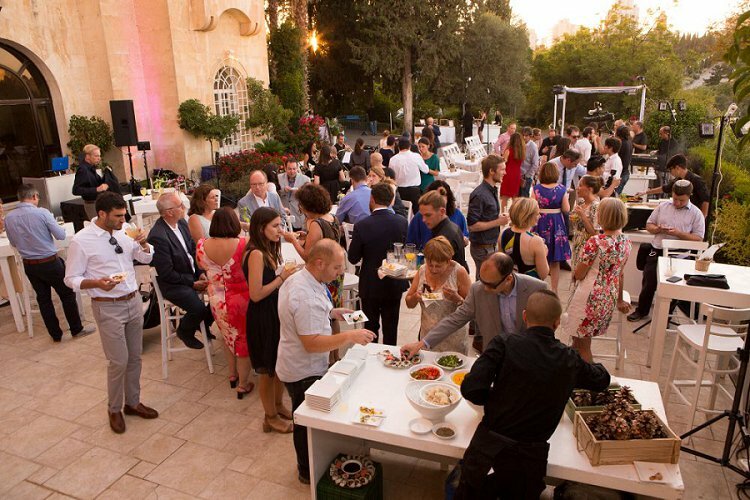 The catering was in a Levantine style to bring the Jerusalem taste into the Scottish Guesthouse and our guests were amazed by the taste, variety and choice. 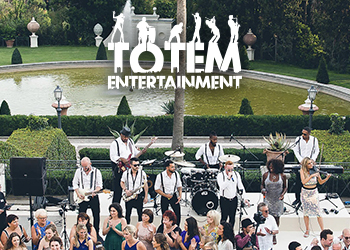 Our fantastic lighting guy, Ofer, recommended and works regularly with one of the top Israeli DJ’s – DJ Tal Haivri! He was amazing! Our only concern was that was over qualified for our event! In the end, it was brilliant that we worked with Ofer and Tal. 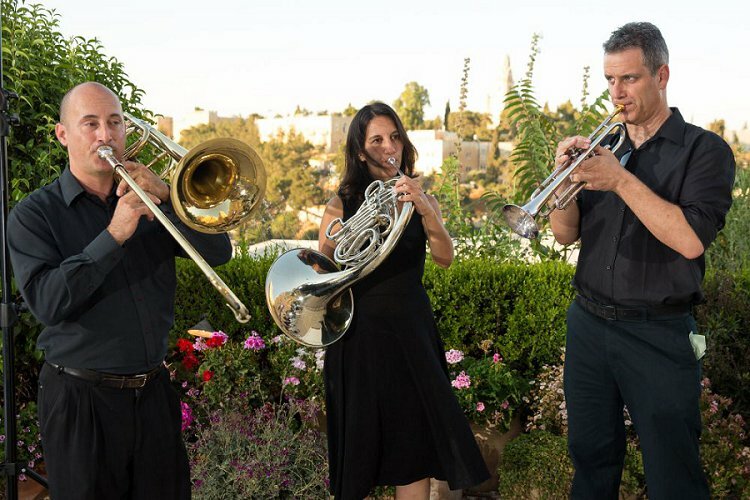 Tal worked with our steel brass band to create some bespoke songs for us for the chuppah, which was so thoughtful. 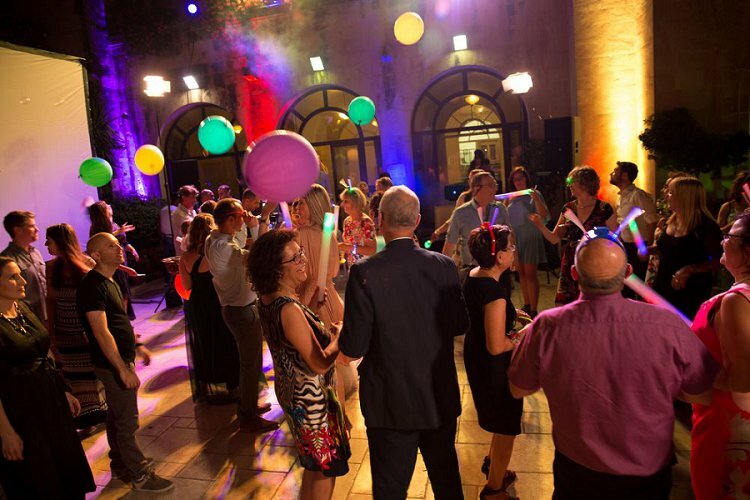 Ofer and Tal also surprised us during the party with throwing huge illuminated balloons over the party to create a ‘light party effect’ during the night in Jerusalem. I made a speech (echoing my mother, who also made a speech over 40 years’ ago at her wedding!). I wanted to make a speech to sincerely thank my parents for all their support and, of course, my guests, who had travelled from abroad. 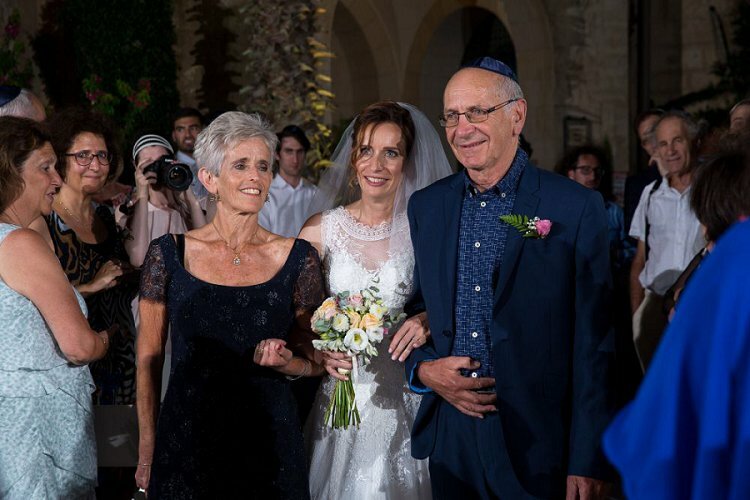 Lior, his mother and my father also spoke which was lovely and something which is unusual at an Israeli wedding. My secret pleasure is bingo! Don’t ask me why, but I love going to Gala, Beacon or Mecca Bingo in London. It is a bit of a joke amongst anyone who knows me. Lior came up with a really cool idea to have a bingo trivia game about our relationship at the wedding. The first one to get a full house was the winner! Of course, I bought the dabbers from London to create an authentic bingo experience. I think we taught all the Israelis a new word – dabber! It was very funny, and I think everyone will remember the wedding for this crazy bingo game! My big tip is to appoint friends and family to take responsibility for ensuring everything goes to plan, so share all the details with them and assign them tasks, as during the day, you want to just relax and enjoy it!